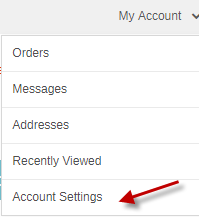 Answer: Go to “My Account”and select “Account Settings” from the drop down menu. 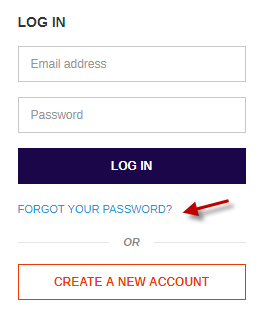 Question: I forgot my password. How do I get a new password? Question: Who can help me find the part I need? Answer: If you are having difficulty finding a part online, please contact our Technical Support team. A representative will help you identify the part you need and send you a link for you to confirm it is correct. Please reach out either by phone, email, or Chat as follows: Fujitsu Technical Support (USA) 1-800-626-4686 (option 2) or by email tsupport@us.fujitsu.com or click here to chat with a Technical support agent. Question: How do I know what scanner model I have? Answer: The model name/number is located in the left upper corner of your scanner. Question: Can I call Fujitsu and order parts over the phone? Answer: The Fujitsu Scanner Store is set up for fast order entry. The Technical Assistance Center can help you find the part you need but they do not have access to order the part for you. Question: Who can I speak to about my existing order? Answer: Please contact our Customer Support team, a representative can answer inquiries regarding your existing order via phone Customer Support 1-800-301-9475 (option 3) or by email at eit@us.fujitsu.com. Question: What do I do if the part I am looking for is not in stock? Answer: Please call our Customer Support 1-800-301-9475 (option 3) or by email at eit@us.fujitsu.com. A representative can determine when the part will be available. Question: What if I need to pay for my order by purchase order (PO)? Answer: You can apply for a line of credit by filling out a PO Account Request Form. The form requires your Dun & Bradstreet (DUNS) number and your company’s financial statements for the last two years. Fujitsu reserves the right to accept or reject any application or purchase order, at its sole discretion. Please note Fujitsu requires a minimum order amount of $500 or greater to place an order via purchase order. If an individual order is below the minimum amount of $500, payment must be made utilizing a credit card. If you are approved for a purchase order account, a copy of your purchase order must emailed to eit@us.fujitsu.com after your order is placed on the Fujitsu Scanner Store. The following items are required on the purchase order: the bill to and ship to addresses, part number(s), price and quantity ordered, Net 30 payment terms and Fujitsu Computer Products of America, Inc 1250 East Arques Avenue, Sunnyvale, CA 94085 listed as the vendor. If you are interested in applying to pay by purchase order, please fill out the PO Account Request Form found here and email the completed form to eit@us.fujitsu.com. If you have questions, please contact our Customer Support team. They can be reached at: Customer Support 1-800-301-9475 (option 3) or by email at eit@us.fujitsu.com. Question: My business is tax exempt. How do I update my account to reflect my tax exemption? Answer: You will need to email a copy of your Official Tax Exempt Certificate to the Fujitsu accounting department at ecomaccounting@us.fujitsu.com or Contact our Customer Support team. They can answer inquiries regarding how to setup your account to be Tax Exempt. They can be reached at: Customer Support 1-800-301-9475 (option 3) or by email at eit@us.fujitsu.com. Answer: The Fujitsu Scanner Store offers a 30-day money back guarantee on Fujitsu and ScanSnap scanner purchases, but is not applicable for RentScan or for scanners that are on a subscription. The return policy for all other products sold on the Fujitsu Scanner Store is as follows: All accepted orders are final, noncancelable and nonrefundable. See complete Terms of Sale here. Question: How do I qualify for free shipping? Answer: Scanners, spare parts and consumables orders are eligible for free FedEx Ground shipping (3-5 business days) when the order total is $200.00 and over (before tax and shipping). RentScan products are not eligible for free shipping. Fujitsu Service and PaperStream Software are not shipped. Question: Can I ship my order to a Post Office (P.O.) Box? Answer: All items are shipped Federal Express (FedEx) and can only be delivered to valid street addresses. We do not deliver to P.O. Boxes. Answer: You can track your shipment by using the tracking number you receive in the shipping confirmation email. Question: Do I need to sign for my delivery? Answer: All orders from the Fujitsu Scanners Store require an adult signature upon delivery. Further delivery information can be found in the Terms of Sale. Question: Where do orders ship from? Answer: All products are shipped from Sacramento, California. Question: Do you ship outside the United States? Answer: The Fujitsu Scanner Store is only authorized to ship to the 50 states in the U.S. Question: How do I contact the Fujitsu Scanner Store?